0*LOW POWER 2400 VDC MODEM designed to run on extremely low current from the DC power idea for Solar Power applications. The LP9624 Modem ( 300bps Bell 103, 1,200bps Bell 212 & V.22 , and 2,400bps V.22bis) runs on 9 to 15 VDC and is ultra-compact and easy to install. It's designed to run on extremely low current from DC power and is idea for Solar Powered applications. 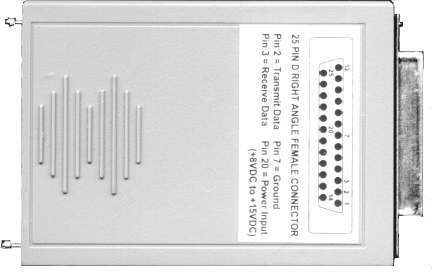 This unit is designed for applications where power can be provided at pin 20 ( DTR ) of the DB 25 connector. Current consumption in active state is less than 75 ma and in power down mode, less than 20 ma. After 5 seconds of inactivity, the unit automatically goes into power down mode. The LP9624 Modem (300, 1,200, and 2,400bps) runs from 6 to 15 VDC and ultra-compact and easy to install. This rugged little unit is designed for applications where power can be provided at pin 20 (DTR) of the DB-25 connector. Current consumption in active state is less than 70ma and in power down mode, less than 20ma making it ideal for those solar powered applications. The Modem is ultra-compact and easy to install. The LP2.4 designed to run on extremely low current on pin 20 or optional power cable. The other end of the modem connects directly to your RJ-11 telephone cable and has Surge Suppression of 15,000 Volts. The LP9624 operates at speeds of 300, 1,200, 2,400bps. The modem also features automatic answer and will connect to any speed modern, the modem automatically "falls back" to match the speed of the slower modern. The modem can also be locked to any of the 3 speeds. The Modern is compatible with all communications software features automatic answer mode, so it can operate unattended in those remote sites. It will operate over rotary or push-button lines since it works in tone or pulse dialing modes. The Modem complies fully with the Hayes' Standard AT Command Set and the ITU V22 bis and V.22 standards, as well as Bell 103 and Bell 212A protocols. The Modem connects directly to your DTE comm. port and operates on all telephone Lines. Though it's tiny and needs little power, the Modem still supports all the standard Hayes AT commands including basic, dial and register commands. The Modern also uses industry - standard result codes that let you know if the commands worked properly. This modem can replace the Bell 103, 212ALP, V.22bis modems and yet it is in a small case the size of a DB-25 connector head. This allows the modem to be used where space is at a premium. Hayes " AT " command set compatible. -20 to +80 C temp. Enclosure size 2 1/4" x 3 1/4" x 7/8". power down mode runs at 22 milliamps.